It's is the first of the five niyamas, disciplines that refer to one's relationship with self. Sauca means purity, or cleanliness. In sheer practical terms, it means keeping your body clean and for yogis this means not just your body, but also keeping the space where you practice clean—clutter free, distraction free, visually soothing. Tall order if you practice in your living space, but there is something so calming and clarifying when you clear your little space of junk and dirt and roll out your mat. The mind becomes clearer and more focused. The practice flows from there. So imagine my delight on Tuesday when I beheld the prop cabinet (seen above), rigorously organized and tidied by a work/study angel! It gave me such deep pleasure to see everything lovingly organized in its place. We, teachers and students, walk by this cabinet on our way into practice. 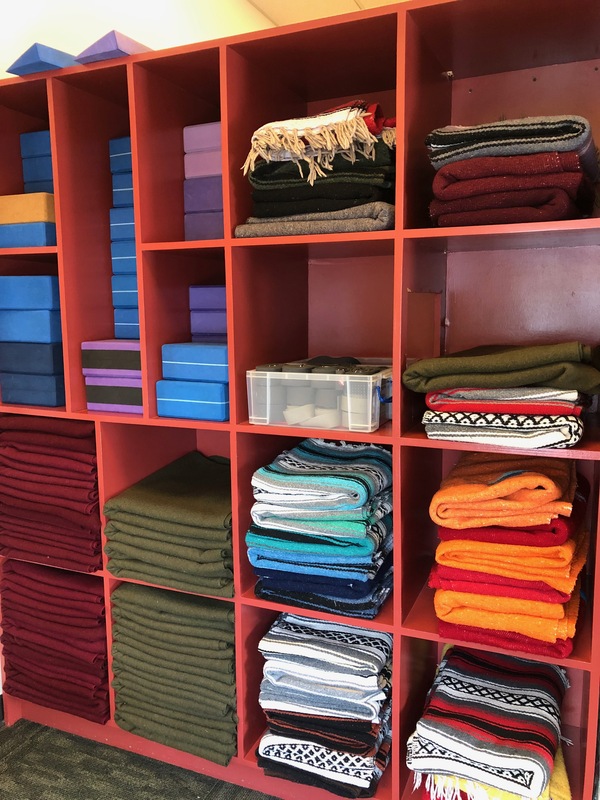 Surely the state of things there helps inform how we come to practice, how we unfold and smooth our mats, how we fold and unfold and re-fold our blankets, and how much clarity translates from that initial impression, into our yoga practice. Often we are rushing out of class and onto the next thing. it's the nature of life for most of us, myself included. If we all took just a little bit of time to restore order to our props, neatly rolling our mats, and "collecting" ourselves before flying out the door, there's a pretty good chance the quality of that effort would reverberate throughout the day, and into whatever comes next, after walking out the door. As a teacher, it's a joy to register that calm order in the prop cabinet on my way in to teach, rather than averting my eyes from the chaos and opting not to "see" it as such. It reminds me, that glance, to similary collect and organize my own thoughts and intentions around teaching before I enter the space. Thanks one and all, and please note the highlighted changes in the schedule (next box) for February!